The Rooftop views of all of San Miguel de Allende from Casa Feliz include the Angela Peralta Theatre to the left and famous art school, the Bellas Artes at the center of the photo - both located within one block of the house. 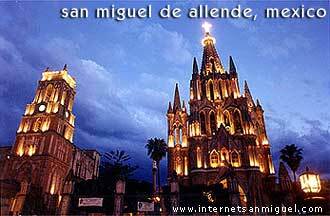 Located in San Miguel's historic 'El Centro'. Beautiful 4 bedroom home each with individual bathroom, living room / dining room, patios with fountains, tables, Jacuzzi for 4 ï¿½ 6 people, located in the historic center. Both houses include all services, gardener, and maid / cook (Monday through Saturday). Beautiful 4 bedroom home, 3 ï¿½ bathrooms, living room, dining room, fully equipped kitchen, gardens, terrace with spectacular view of the city, just 7 ï¿½ 10 minute walk to the Jardin (San Miguel de Allende's town square). 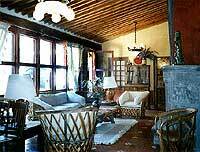 Two vacation rentals with spectacular panoramic views of San Miguel de Allende, the lake and mountains. La Casa de la Vista, a private beautifully furnished casa with full kitchen, 2 master bedrooms each with private bath, LR, DR and den perfect for one or two mature couples to share. Our new little Casita, a private guest cottage, cozy and perfect for one couple. King-size master bedroom, kitchenette, sitting room, 1ï¿½ baths and private garden patio. 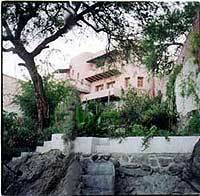 Beautiful horizontal condos, just 5 units in a quiet and secure area, just 2 1/2 blocks from the center of San Miguel. Linens changed weekly, towels changed twice per week. 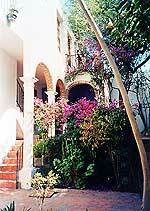 Two apartments and a house located in a beautifully restored 200-year-old colonial home in San Miguel de Allende, Guanajuato, Mexico. It is centrally located on a lovely quiet residential street at Terraplen #44, between Aldama and Jesus, just a three minute walk from the Jardin, art schools, restaurants, cafes, and shops. Enjoy the comfort and privacy of staying in your own 2 acre gated community during your visit to San Miguel. Villa Xichu has everything one would want from a rental ï¿½ a waterfall, pond, heated pools, Jacuzzi and steam/changing room, plus entertainment areas with cooking/bar facilities that are perfect for large events. Six luxurious villas display Villa Xichu's artistic details, and your Mexican hostess is eager to welcome you. Enjoy the peace of Villa Xichu. For more Information and Reservations for this Vacation Rental. Grand 2 Bedroom, 2 bath home with lovely bi-level garden/patio. Master Bedroom Suite, and Large Second Bedroom. Also has a sun terrace, cable TV, telephone, stereo, three fireplaces and a full-time maid to cook, clean and do your laundry. It is fully furnished. The master suite includes a large dressing area, luxurious bath, and a private terrace. The second bedroom has 16' ceilings and an interior balcony. The house has arches and columns, as well as remarkable architectual detail. It's a short walk to the center of town. You can swim in nearby natural hot springs and visit many historical sites. The local Club de Golf allows weekly and monthly memberships. Seven casitas are situated around a meandering garden where visitors can enjoy an afternoon reading near a fountain or relaxing inside with Mexico-inspired decor. The centro of San Miguel and major shopping areas are a 5-7 minute, flat walk away. The casitas are available for individual rental. For groups, a large dining room and restaurant-kitchen is on site. Ideal for family reunions, large events, on-site workshops, and more. Amenities : Cable TV; Kitchenette; Linens; Gardens & Fountains; Maid Service; King-size or 2 Twin beds. Spacious, Barragan-style home, with 2 bedrooms & 3 bathrooms, located in San Miguel's prestigious Atascadero neighborhood. Quiet, light filled home, comfortably furnished, with antique touches. Jacuzzi, lush garden areas, 3 fire places, Direct TV, telephone, and secure, off-street parking. Daily maid service, gardener / handyman included. 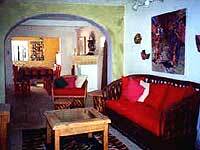 ROMANTIC HIDEAWAY four blocks from San Miguel's main square. One bedroom with king-size bed, full bath, spacious fully equipped kitchen, living room with balcony. Lovely garden filled with trees and flowers. Luxuriously furnished with art and antiques. Rents are based on length of stay or time of year. Sunny and beautiful Mexican-style home with 3 outdoor seating areas including breathtaking rooftop view of the city and sunset. Includes: 3 bedrooms, 3 full baths, living room, TV room and raised dining area w/view of outdoor fountain. - Outdoor veranda on second level adjoins bedrooms. - Circular architecture w/ central patio built to provide outdoor feel while relaxing indoors. - Other amenities include: twice-a-week maid service, washer/dryer and garage. 20 minute walk to downtown. Guests call us "the best deal in town". Two private suites, available separately or together, in a large, centrally located home overlooking the flower-filled courtyard with fountains. Your option of two twins, queen or king size bed. Each room has a sitting area for lounging, as well as a small table for dining, and are also equipped with a kitchenette for modest cooking and each have their own fully tiled bath with large shower. Just five minute walk to the town square (no hills), near the crafts market. Maid service is provided four days per week. 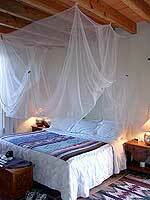 Cost: US $75 per night, per suite, or $140 for both suites per night, includes all bills, except telephone. Lovely, large country home, comfortable, peaceful, inviting. Cook's and gardener's delight. Brick oven, sauna, tennis court, gardens, horse corral and stables. Beautiful location near Atotonilco, horse and bike trails. Twenty minutes from San Miguel's el Centro, on 5 Acres. Architect designed Casa Chepito is located minutes from the Jardin, on a quiet street adjacent to the Orchid Farm. It offers 100-mile vistas from its three balconies and lush interior views of a mature garden of giant bamboo and organos cactus. 2 bedrooms, 2 baths, semi-enclosed Japanese ofuro bathing area. Well equipped kitchen. Sleeps 6. TV, VCR, CD player, telephone, fax. 2 mountain bikes available. Maid, gardener included. Cook available. New colonial-style, 2-bedroom home, located in a residential neighborhood, only a 15 minute walk away from the center of town. The dining/living room areas are beautifully decorated with large windows and doors looking to the garden. Barbeque on the patio or swing in the hammock with the sound of the fountain in the background and you may not want to go to town. Rental includes maid/gardener service, 4 gas fireplaces, 3 televisions with cable & VCRs, telephone and garage. Deliciously light and airy, surrounded by garden with pool, like living in an elegant tree house, VERY comfortable, private, secure and perfectly located near center of town. Two bedrooms--master w/king bed, second is office with desk and double sofa bed, 1ï¿½ baths. Garage, phone, TV w/cable, VCR, cassette/CD player, maid 3 times weekly. Free high speed internet and free VOIP calling to the US and Canada. Conveniently located in a quiet Los Frailes neighborhood, minutes to downtown, Casa Rodriguez offers luxurious rental space for up to 8 people. It includes a maid/cook from Monday to Saturday, VCR, Cable TV, local telephone, secure garage for 2 cars. Casa Rodriguez has four bedrooms (two with private bathrooms, 2 with shared bathrooms), a large, bright living/dining room in a spacious home surrounded by beautiful gardens, patios, and heated lap pool with separate private cabanas. $1000 per week - deposit $500. $1800 - two weeks - deposit $750. $2500 - three weeks - deposit $1000. $3000 - 1 month - deposit $1250. Rates slightly higher during holidays. San Miguel de Allende, Gto., Mexico. Home is furnished with quality furniture and antiques. Serene Mexican Villa with breathtaking views of the surrounding mountains and valleys, several gardens and fountains, and a pool. Four bedrooms (6 Beds) 2 ï¿½ baths. Gourmet kitchen, Outdoor and Indoor barbecue grills. Covered patios and roof terrace. Mexican and US satellite TV, stereo system, VCR. Car and Driver available for commuting to/from San Miguel. Horses, riding lessons available, supervised riding only on premises (optional). 18th century stone oratorio (church) converted into MAGICAL home in the centro historico. Terrace with panoramic view of San Miguel de Allende. 5 1/2 blocks to "Jardin"
Small pool surrounded by lush courtyard. Purified water throughout house, fireplaces, phone/fax, cable TV/VCR; CD, maid/cook (Monday ï¿½ Saturday). "Artist owned, art filled, more than another pretty house!". 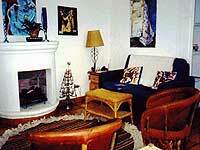 Artist's home with 2 apartments + studio, close to Instituto Allende. Upstairs Apartment - $675 per month, $250 per week. 1 bedroom, sala with sofa bed, gas fire place, kitchen/dining room, small patio, lots of light and air. Downstairs Apartment - $700/month, $300/week. with closet, sala. Also has studio with daybed and goes with downstairs apartment, except by special arrangement. Both include all utilities, TV cable ready (Cost of cable is not included in the rent), local phone, weekly maid service, shared roof garden and laundry. Casita located in the upper section of Los Frailes neighborhood. Enjoy peaceful living in this fully furnished casita, surrounded by charming patios and terraces yet just minutes to downtown. The casita includes a living room with gas fireplace, dining full equipped kitchen, 1 master bedroom (king size bed), 1 1/2 baths, laundry facilities, maid (two times/week), satellite TV (US programming), local phone (available on deposit). This exquisite, light-filled casita is in immaculate condition and ready for you to enjoy! Vacation Rental (short term): $300 per week (two adults) or $1000 dollars/month. Deposit $500 dollars. Long Term (six months +): $600 dollars/month (utilities/maid service not included).